Salads: they’re green, damp, and kids like to eat them. Oh, wait. Those are boogers. Kids hate salad. And while it’s all well and good to have the same palate as someone who considers mac and cheese haute cuisine (no judgment, that stuff is delicious), you’re going to eventually need to get some antioxidant- and fiber-rich greens into your system. Because being a grown-up means a lot of things related to responsibility, one of which is taking care of yourself. Here's how to fully enter adulthood and start liking salad. Mesclun, arugula, or spinach are other alternatives that pack way more flavor than iceberg lettuce. 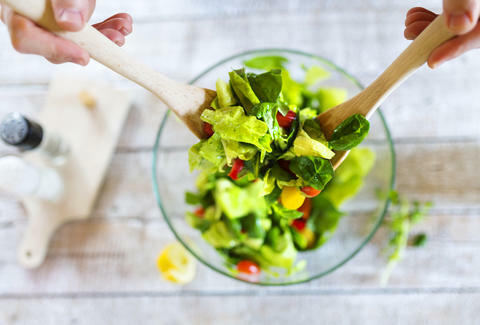 If the thought of raw greens really grosses you out, try a non-lettuce-based salad, such as a beet salad or a Caprese salad of tomatoes, mozzarella cheese, and basil, Goldberg suggests. Nobody’s saying you should pile a pound of bacon on top of your salad... but you can get away with a few ounces of everyone’s favorite carcinogenic meat if you play your cards right. Dietitian Dena Norton has a warm bacon dressing recipe she swears by. “If you’re having a huge bowl of plant foods and you sprinkle it with some bacon so you’ll enjoy it, I think you’ll come out ahead in the long run,” she says, adding that she buys pastured bacon directly from a farmer and salts it at home, so she avoids consuming the nitrates that are used to preserve most commercial bacon. Anyway, enough bacon talk. When it comes to indulgent toppings, there’s also Chinese noodles, croutons, and creamy dressings like ranch or blue cheese. Remember that old trick where you order dressing on the side and dip your fork in it to get the flavor but not the calories? Forget that stupid trick! Douse your salad in rich, savory dressing. 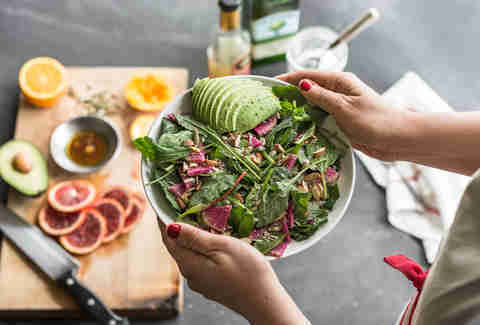 “If you’re eating a good salad with lots of vegetables, who really cares if you use one or two tablespoons of dressing?” says holistic nutritionist Christina K. Major. Plus, it’s super easy to make dressings. No matter how lazy you are, you are most certainly capable of combining extra-virgin olive oil and apple cider vinegar. Feeling ambitious? 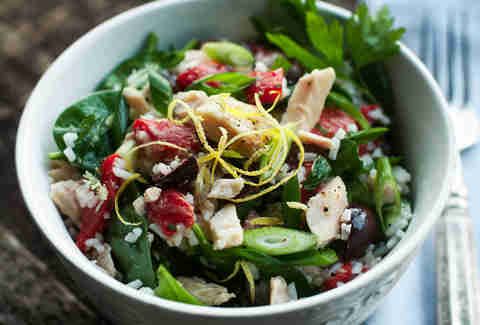 Add a touch of honey and mustard, advises clinical nutritionist Jennifer Cassetta. Cold, raw lettuce and sliced carrots in winter? That’s gross, and not what a tasty salad should look like. “It’s important to mix raw and warm ingredients,” Cassetta says. 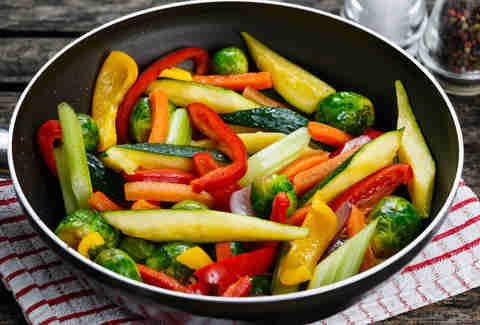 This can mean freshly roasted nuts and vegetables, quinoa, a soft-cooked egg or two, sauteed asparagus... any of these will make you feel more like you’re eating a full meal and less like you’re cleaning out your refrigerator produce drawer bite by bite. And if salad still doesn't sound appetizing? Get over it! Missy Wilkinson isn’t crazy about salad, but she mixes a big handful of greens into her smoothie each morning. Follow her for more spinach-hiding tips: @missy_wilkinson.